The name opal derives from the Greek Opallos, meaning “to see a change (of color).” Opals range in color from milky white to black with flashes of yellow, orange, green, red, and blue. An opal’s beauty is the product of contrast between its color play and its background. Opal is a formation of non-crystalline silica gel that seeped into crevices in the sedimentary strata. Through time and nature’s heating and molding processes, the gel hardened into the form of opals. 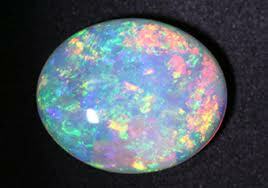 The opal is composed of particles closely packed in spherical arrangements. When packed together in a regular pattern, a three-dimensional array of spaces are created that give opal its radiance. No stone has varied more in popularity and acceptance due to superstitions dating back over a century. NYC Wholesale Diamonds has a line of Fine Opal and Diamond Jewelry, and custom designes rings, necklaces, earrings and bracelets for our clients. Call (212) 719-2214 for an appointment or a quote. Tourmaline has become a favorite gemstone among jewelry designer, and gem collectors the world over. Since it is available in a wide variety of colors, it is ideally suited to almost anyone’s taste. Tourmaline also is known for displaying several colors in the same gemstone. These bi-color or tri-color gems are formed in many combinations; gemstones with clear color distinctions are highly prized. One multi-color variety is known as watermelon tourmaline, and features green, pink, and white colors bands; to resemble its namesake, the gemstone is cut into thin slices having a pink center, white ring, and green edge. Tourmaline is found in many localities including Brazil, Afghanistan, East Africa, and the USA. NYCWD has a line of Fine Tourmaline and Diamond Jewelry, and custom designes Tourmaline rings, necklaces, earrings and bracelets for our clients.